It Follows adopts the curse plot and delivers a doozy. Whoever the curse lands upon will be plagued by a malevolent force which adopts different guises, sometimes people known to the victims, sometimes strangers. Some have clearly endured trauma, others are more obviously rancorous. But, all are signs of impending doom and though they travel at shuffling pace, no matter where you run they will catch up eventually. And the way in which the curse is transmitted taps into themes of sexual dread at the heart of many a classic horror tale dating back to Little Red Riding Hood. Which is what elevates It Follows into five blood-red stars territory; it’s as scary to mull over as it is to watch. Mitchell can stage a genuinely frightening set-piece and does so in the opening scene, revealing what happens when It catches up with a victim, all set to Disasterpeace’s thumping John Carpenter-esque synth score. But, as intriguing is what is roils beneath the surface of his script: a fear of entering the terrifying adult world, with its responsibility and decay. After close encounters with a variety of disquieting spectres (deftly used by Mitchell for at least three leave-the-seat scares), Jay and her gang pointedly retreat to childhood sanctuaries of a playground or a beach. 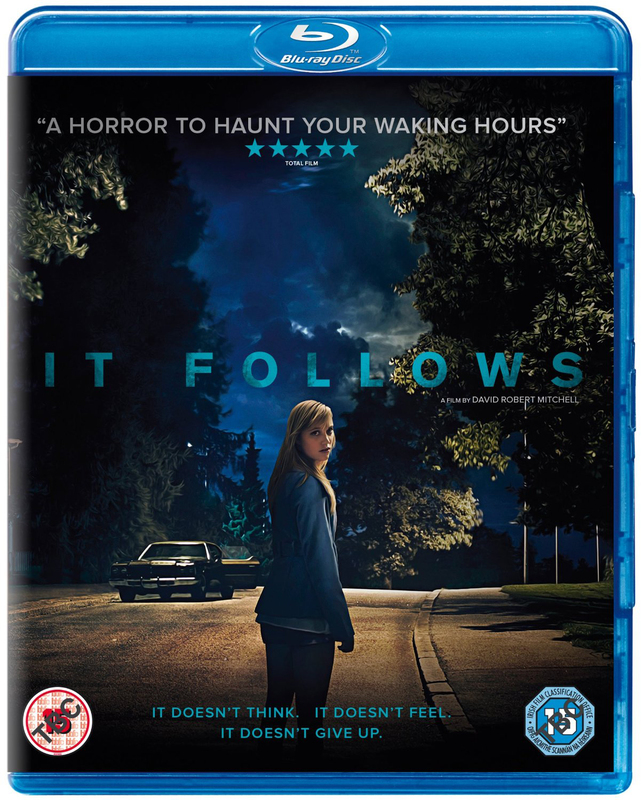 Beyond rich subtext, It Follows imaginatively conspires various methods to shake a curse that reverts back to the previous “owner” if the latest target perishes. A swimming pool denouement may be a nod to Let The Right One In, but is exhilarating in its own right and even seems to reference Italian masterpiece Blood and Black Lace. Like The Babadook or Ti West’s undervalued The Innkeepers, the characters seem to inhabit a pop-culture netherworld where Charade is playing at the local cinema and old movies and cartoons loop on TV. All that suggests this is happening in modern day are boarded up houses and shops, adding credit crunch anxiety to a brutally clever slice of the uncanny. Blu-Ray Review: Good transfer, preserving the muted tones of Mike Gioulakis’ cinematography and the vividly realised post-economic collapse feel of the Detroit locations. The main extra is an audio commentary by journalist Danny Leigh and Mark Jancovich, Professor of Film and Television Studies at the University of East Anglia. It’s an engaging talk-track, placing the film within the history of horror cinema of the past thirty years and discussing the major themes and recurring motifs writer/director Mitchell focusses on. Approaching the movie from a film theory perspective, Leigh and Jancovich are never less than interesting, but background information on the cast and crew and how the project came to be would have been useful. In 2014 Maika Monroe also appeared in Adam Wingard’s The Guest, another horror movie that owes a debt to 80s cinema and has parallels with It Follows, all of which is worth including. A 5min interview with composer Disasterpeace (real name Rich Vreeland) provides a potted account of how he came to work with David Robert Mitchell and the different cues used for various moods in the film, while a short Gallery video presents shots of presumably an unused poster design (no contextualising information is given). Completing the extras is the theatrical trailer. The audio commentary is the most rewarding special feature, but input from Mitchell himself would have been worthwhile. But, as this is likely to be one of 2015’s best movies, it follows that this is a must-purchase item.